Tainted melon has sickened 60 people in five states. Find out whether you're at risk and how to stay safe. On the heels of an E. coli outbreak caused by contaminated romaine lettuce, another food poisoning scare involving fresh produce has come to light. 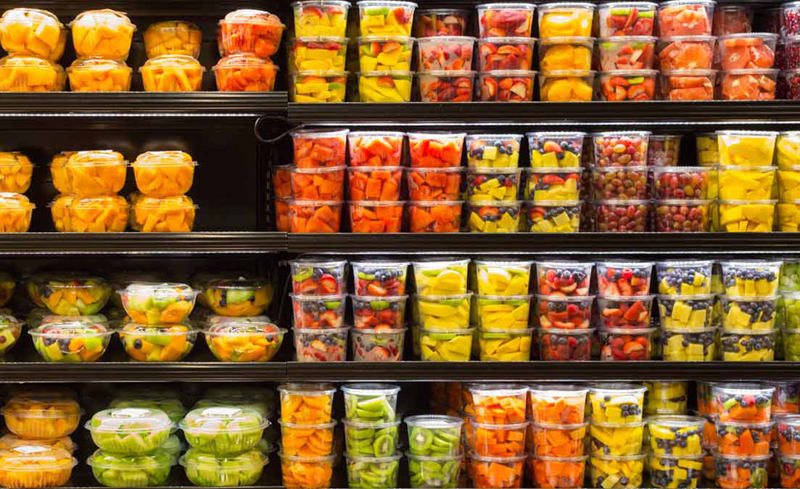 At least 60 people have been sickened and 31 hospitalized after eating prepackaged, presliced melon contaminated with salmonella, the Centers for Disease Control and Prevention first announced June 8. Unlike the E. coli outbreak linked to romaine lettuce this past spring, investigators have identified the source of the contaminated melon. The packages of melon were shipped to 12 states—Georgia, Illinois, Indiana, Iowa, Kentucky, Michigan, Missouri, North Carolina, Ohio, Pennsylvania, West Virginia, and Wisconsin—with illnesses reported in five states. Caito Foods, a packager and distributor based in Indianapolis, voluntarily recalled presliced watermelon, honeydew, cantaloupe, and fruit mixes containing one or all three of these types of melon packaged in clear plastic clamshell containers. The packages were shipped to major retailers including Costco, Jay C, Kroger, Payless, Owen’s, Sprouts, Trader Joe’s, Walgreens, Walmart, and Whole Foods/Amazon between April 17 and June 7, 2018. The latest reported illness was May 28. Nevertheless, it’s still unclear exactly how the contamination happened in the first place. “And even when a company recalls the product, it can still be confusing for consumers to tell if they are affected,” says Jean Halloran, director of food policy initiatives for Consumers Union, the advocacy division of Consumer Reports. CR’s food safety experts put this Q&A together to help you understand the steps you need to take. Q. If I don’t live in one of the 12 states, do I need to avoid precut melon? Probably not. The outbreak appears to be limited to this producer and the states and retailers listed above. Q. How do I know the outbreak won’t spread to more states, as it did with romaine lettuce? There is a possibility that more states will be added, says James E. Rogers, Ph.D., director of food safety research and testing at Consumer Reports, because we don’t know how widely the contaminated melon​ was distributed. Additionally, he says, the potentially contaminated melon was shipped to only a handful of states in the Midwest. In the case of the E. coli outbreak linked to romaine, the contamination affected lettuce grown in a region (Yuma, Ariz.) that supplies the entire country. Still, it’s a good idea to check the FDA’s web page on the outbreak periodically for updates. Q. How do I find out whether the melon I bought is contaminated? The package may be labeled “Distributed by Caito Foods,” but you might not always see that on labeling. “The melon was sold under several brands, and only in some cases does the Caito Foods name appear,” Rogers says. You can find a list of recalled products at the FDA’s website. Check the UPC code on the package. If the number on your package of melon matches any from the list of recalled products, throw it away or return it to the store for a refund. If you have questions about the melon you purchased, you can also call the hotline set up by Caito Foods at 844-467-7278 between 7 a.m. and 11 p.m. ET Monday through Friday, and 7 a.m. and 7 p.m. ET Saturday and Sunday. “Caito Foods takes food safety seriously and is committed to following strict procedures regarding product handling and the cleaning and maintenance of our facilities to deliver the high-quality products our customers have come to expect for more than 50 years,” a spokesperson for the company said in a statement. The company is no longer shipping packages of melon from the affected facility, and it has notified retailers of the recall so that they can pull the product from their shelves. Once cut, melon has a short shelf life—about three to five days. The last shipment from Caito Foods was June 7, so it’s possible that a tainted container is still in your fridge. And some people freeze melon, especially watermelon, to extend the shelf life, a spokesperson for the FDA said. If you shop in one of the affected states and you can’t remember where you bought the melon in your fridge, or you can’t find the packaging to check the UPC code, CR’s food-safety experts recommend that you throw the fruit out. Keep in mind, too, that once the bacteria is in the fruit’s flesh, you can’t get rid of it by rinsing it off. Q. Are restaurants affected by this outbreak? No restaurants have been named in the outbreak, and the affected facility didn’t supply melon to restaurants. Still, it’s possible that some restaurants might purchase melon from a grocery store, according to the FDA spokesperson. If you’re dining out in one of the 12 states and want to order melon, ask where it came from. If the staff doesn’t know, it’s probably best to skip it. Q. Are whole melons safe to eat? As of now, yes. While the FDA is still investigating this current outbreak, nothing suggests that whole melons sold in supermarkets are involved. Still, you should take food safety precautions when preparing any produce—especially cantaloupe, because its rough rind can trap salmonella and some other types of harmful bacteria, according to the FDA. One of the worst foodborne disease outbreaks on record involved cantaloupe contaminated with listeria in 2011, in which 143 people were hospitalized and 33 died. The FDA suggests that when choosing a melon from a store, pick one with an intact rind that hasn’t been dented or bruised. Rinse the outside of the melon with water, and use a vegetable brush to scrub the surface before slicing through it (though experts are still mixed on whether rinsing effectively gets rid of bacteria). Clean your knife and cutting board before scooping out the cantaloupe and cutting into the flesh. Wash your hands with soap and warm water between touching the rind and touching the flesh. After slicing, keep melon refrigerated to retard bacterial growth. Q. Is precut produce more likely to be contaminated than what you slice yourself? Precut produce is a time-saver, Rogers says, but it may be more likely to be contaminated with bacteria. When you cut into produce, you increase the risk of transferring bacteria. In commercial facilities, many fruits and vegetables are processed in one place, creating opportunities for cross-contamination. You have no way to know—nor do you have control over—whether the prep area, surfaces, and utensils were sanitized correctly. Because of this, says Rogers, it’s safer to buy your own melon, wash the surface, and cut it yourself. If you do buy precut, bagged, or packaged produce, the FDA advises choosing unbruised products that are refrigerated or packed in ice. Keep produce away from raw meat, poultry, and seafood in your shopping cart, bag, and refrigerator to avoid cross-contamination of bacteria. Q. How dangerous is salmonella poisoning? Salmonella is the second-most common cause of food poisoning in the U.S. About 400 people die each year from it. While most people recover from a salmonella infection on their own within four to seven days, some people can develop diarrhea so severe they need to be hospitalized. And if the bacteria spreads from the intestines to the bloodstream, it can cause a life-threatening infection known as sepsis, which requires prompt treatment with antibiotics. Vulnerable groups, such as pregnant women, young children, the elderly, and those with compromised immune systems, are more likely to have severe symptoms or have serious complications from a salmonella infection or other foodborne illness. Q. How do I know whether I have salmonella—and what should I do? Most people will get diarrhea, a fever, and abdominal cramps 12 to 72 hours after they eat the tainted food, with symptoms typically lasting four to seven days. Vomiting can occur but isn’t a classic symptom. If you are sick, the most important thing is to stay hydrated. Drink plenty of water, juice, broth, or other caffeine-free, nonalcoholic fluids. Call your doctor if you have diarrhea that lasts for more than three days, if the diarrhea is bloody, or if you have a fever of 101.5° F or higher. Editor’s Note: This article was updated June 14, 2018, to reflect the FDA’s announcement of the 10th, 11th, and 12th states (Pennsylvania, West Virginia, and Wisconsin) involved in the outbreak. It was also updated June 13, 2018, to reflect the FDA’s announcement of a ninth state (Iowa) involved in the outbreak.